The subject of tribute bands has always been a bit hit and miss with me but there are a few bands like The Bootleg Beatles that literally take the phrase tribute band to the next level and the Australian Pink Floyd (TAPFS) are certainly no exception to this. The Aussie Floyd (TAPFS) where formed in believe it or not Adelaide Australia in 1988 by Lee Smith a local Floyd obsessed guitarist, drummer Grant Ross and bassist Trevor Turton and the trio soon realised they needed to expand from being a trio if they where to realise there dreams of becoming more than just a local band who covered Pink Floyd songs, so they placed an ad in Allans Music store reading “Vocalist and keyboardist required for band. Professional attitude expected. We only play Pink Floyd.” The add was seen by Steve Mac & Jason Sawford joined and rehearsals started with them constantly learning and practicing the songs they also referred to Lee's collection of Pink Floyd albums and bootleg recordings. They also started to create the unique sounds necessary to perform Floyd’s music correctly, and this became, and still is, one of the most important aspects of the band. They performed there first shows for family and friends including Richard Guest & Greg Sutton who both became part the bands early road crew. The band was known as Think Floyd at the start and the new look five piece band stated out like many a tribute band only really gigging locally and domestically frantically trying to earn enough money to take the band to England the home of there idols but with the band struggling to find a constant audience base the band started to drift apart. Peter Whitely replaced Turton and the band refocused there efforts by using a quadraphonic sound system that the band had to lug from venue to venue, this seemed to get the band back on track and there groups first break came, Steve Mac was in England visiting family and whist there he got in touch with a Floyd fanzine called Brain Damage who’s owner Glenn Povey was already planning a Pink Floyd convention at Wembley in August 1993 and wanted Think Floyd to perform. TAPF clocked up the miles in order to raise the money needed to perform at Wembley and before the trip they had to replace Whitely who couldn’t make the trip with Colin Wilson so the new line up boarded a fight to England on the 08th August 1993. 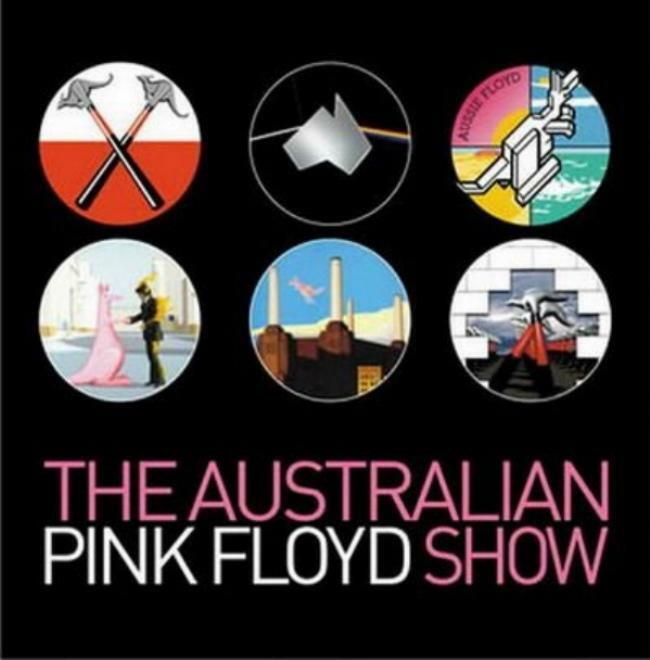 The trip didn’t start well either especially when they landed at Heathrow and British customs impounded all the bands equipment but by the time of the first warm up gig the band was reunited with the equipment and also had changed its name to The Australian Pink Floyd Show. The convention went well for the boy’s who played a mammoth 3 hour set and impressed Povey so much he booked the band for various other events but this took its toll on founder Smith and also roadie Sutton who left the band due to being homesick. 1994 saw the band build up a following in both U.K and Europe and even seen the band have a chance meeting with David Gilmour who visited them backstage at a gig in Croydon culminating in Gilmour inviting TAPFS to perform at a show to mark the end of Pink Floyds Division Bell tour, unfortunately though due to circumstances out of both parties control this fell through although later the band received a call asking them to play at Gilmour’s 50th birthday bash! Following that was always going to be hard but another major turning point for the band came In 1997 when they performed a show at Battersea Power Station - the iconic building known to all Pink Floyd fans as the “Animals” album cover, and the scene of the famous flying pig that but not wanting to be outdone The Australian Pink Floyd uses the idea of replacing items from the original artwork with similar images of Aussie items and in the case of the Animals album cover they replace the pig with a flying kangaroo which had been used to promote the band since the early days. 1998 was another big year for TAPFS when they performed at the legendary Glastonbury festival in England but 98 also seen Grant Ross and roadie Richard Guest return home to Australia although Ross with replaced with a Salford drummer Paul Banney and his 2 drum kits. The touring schedule was relentless for the group as they still tried to forge a following in an ever changing industry forcing the band to a crossroads continue in the same vain as previous years or take it to a whole new level and in 2003 the anniversary of the iconic Dark Side Of The Moon album this presented the group with a chance to perform the full album and put on a show with far more advanced animations than previously seen and the band ended up touring the album from 2003 into 2004 culminating in a live DVD produced at a gig in Liverpool’s Summer Pops Festival. The success of this paved the way for 2005’s 30th anniversary of Floyds Wish You Were Here album with they toured in the U.K, South America and also a show in Malta that saw 10,000 fans attend. One of the U.K shows provided the TAPFS a chance to perform another first when again at the Summer Pops Festival in Liverpool they performed Wish You Were Here then followed it up the next night by playing the Whole Animals Album the year ended with the band playing a 35 date tour of North America. In 2008 the band reached there own milestone with there 20th anniversary an amazing feet in itself with this saw the bands tour increase along with venue sizes an TAPFS started playing Arena’s such as Wembley stadium 2009 & London’s O2 2010. In 2011 TAPF push boundaries even further when they debuted 3D projections, they also enlisted new members in the shape of David Domminney Fowler, Alex McNamara and the backing vocalists Emily Lynn, Lara Smile and Lorelei McBroom. Lorelei was also one of the backing vocalists who performed on Pink Floyd’s ‘Delicate Sound of Thunder Tour’. The following 3 years saw the band perform at major European rock festivals and go on to produce 3 DVDs of their shows. In 2013, the 40th anniversary of “The Dark Side Of The Moon” was celebrated with a brand new tribute to the classic album, performed to capacity audiences in Europe and included the band's first ever concerts in Russia. The Australian Pink Floyd are Currently on tour in the U.K touring Floyd’s wish you where here on the albums 40th anniversary so I managed to see them in Liverpool although this isn’t the first time I have seen The Aussie Floyd in Liverpool as I was lucky enough a few years ago when I managed to see them at the Summer Pops festival 2004.